Samuel T. Cogley ------------------ Elisha Cook Jr. When the U.S.S. Enterprise puts in at Starbase 11 for repairs caused in an ion storm, Kirk gives his report of the circumstances of Lieutenant Commander Ben Finney's death to Commodore Stone. All goes well until Spock arrives with the computer visual tape of the bridge during the crisis. Spock tries to warn Kirk about what is on the tape, but the Commodore takes it and plays it. Kirk's statement claims that Finney went into the U.S.S. Enterprise's ion pod to take vital readings. When the storm made it necessary to jettison the pod, Kirk warned Finney during a yellow alert; he eventually switched to red alert before jettisoning the ion pod. This event occurred with Finney, apparently, inside. What the computer tapes show is Kirk pressing the pod-release switch while still in a yellow alert status. As a result of this, the Commodore informs Kirk that he will have to stand trial for possible court-martial for the death of Finney. Things are complicated even more when Finney's daughter, Jamie, blames Kirk for her father's death. When Kirk meets an old girlfriend, Lt. Areel Shaw, that evening she tells him that she's arranged for a lawyer to come and see him. Unfortunately, she's been assigned to prosecute his case and will try her best to bring him down. Dejected, Kirk goes to his room to find that Samuel T. Cogley has moved in, books and baggage. 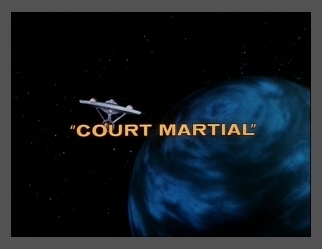 Kirk decides that he likes the quirky lawyer and they begin to plan the captain's defense. On the U.S.S. Enterprise, McCoy reprimands Spock for playing chess with the computer while Kirk is on trial for murder. Spock explains that he has won several games straight ... a feat he should not have been able to accomplish unless the computer is malfunctioning. McCoy's interest is piqued and the two men discuss what this development could mean to the captain's defense. At the trial, just as the defense has rested, Spock appears with the information about the faulty computer. Cogley gives a stirring speech about the rights of men versus machines and the Commodore finally allows the jury to reconvene on board the U.S.S. Enterprise. Spock explains that having programmed the computer for chess himself just months before, the best he should have been able to do is stalemate. Therefore, the officer explains, someone tampered with the computer, adjusting its memory. When asked who had the knowledge for such an action, the Vulcan admits that it could only have been himself, Kirk or Records Officer Ben Finney. Cogley then suggests that Finney is still alive and hiding somewhere on the U.S.S. Enterprise. On the Bridge, the ship's sensors have been boosted to pick up any sound on the ship. Everyone but the bridge personnel and transporter attendant are beamed to the surface and the demonstration begins. Switching on the sensors, everyone's heartbeat on the ship is audible. One by one McCoy, using a white-sound masking device, eliminates the sound of everyone's heartbeat ... except one ... Finney's. Kirk goes after Finney and finds him hiding on the ship. Finney has harbored a grudge against Kirk since they were both ensigns, when Kirk had logged a careless and potentially dangerous mistake of Finney's, which the man claims has kept him from promotion over the years. The two men fight, with Kirk finally winning. Finney had, however, damaged the ship's engines and the U.S.S. Enterprise is losing its orbit. Racing against time, Kirk manages to repair the damage and the U.S.S. Enterprise regains her previous position. Kirk is cleared of all charges and Samuel T. Cogley takes on a new client ... Ben Finney. Wow, would love to hear more about that! Hey McCoy . . . What about Nancy Crater? I like the way Spock explains this. planet Vulcan and he speaks Vulcan. Now, do that with the term 'Human." he speaks Human. Doesn't work does it? You need to use 3 different words for Humans. Just a random thought that I wanted to share. Hey, wait a minute... 1 to the 4th power is still 1!!! So increasing 1 to the 4th power is no increase at all! accuracy sure goofed on this one! Check out the 'Kissed' WAV below.